Anybody else creeped out by this guy? 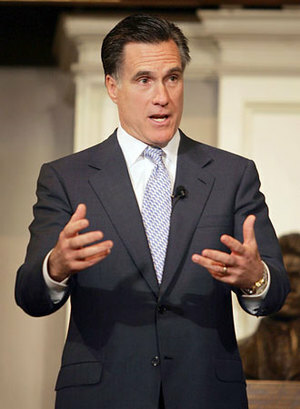 Mitt Romney is more Stepfordish than your average Republican. Romney gives me the creeps every time I see him. I can't quite decide if it's because he is Mormon, has 5 sons, or was the head of a private equity fund. Being the head of a private equity fund to me translates into the rich get richer and the poor get poorer. Mitt Romney what a nice guy. NOT. He is pro-life (flipped his views after being educated about stem cell research), pro-death penalty, against gay marriage, anti-gun control (shocker), and thinks Gitmo should be doubled in size. Romney's whole agenda sends shivers up my spine. I fear for the future of this country. I keep hoping that John McCain will come out with the campaign slogan "Why? Because it's my TURN damn it! ".